NYC, 05/04/2019, 2:00PM. 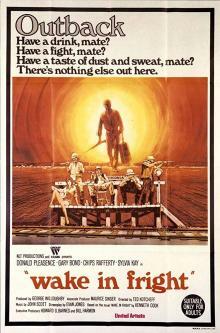 Wake in Fright (1971): Australian Psychological Thriller. 109 min. Director: Ted Kotcheff. Starring Donald Pleasence, Gary Bond, Chips Rafferty. Wake in Fright was one of two Australian films to be nominated for the Grand Prix du Festival at the 24th Cannes Film Festival.